Easy Makeup Tricks For 7 Common Beauty “Problems”! We all have problem spots and areas we’re not happy with - from double chins to acne marks to tired eyes. If we didn’t, we would be pretty different from everyone we know! Dealing with these problem areas can be a task, especially if you’re unsure about what products to use. Well, not anymore - we bring to you a helpful guide on what concealer to use and HOW for common problems that we all face! Follow these tips to cover up like a pro and no one will ever know! Can you say #Flawless?! DON’T substitute your foundation for concealer. Use them together. DO use a mineral-based concealer if you have oily skin. 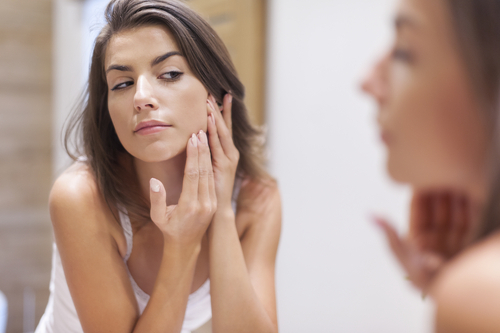 Has your troublesome acne left its mark behind on your face? Concealing acne marks is easy enough with the right makeup tricks. Begin by applying foundation and primer on your entire face. Then, choose a concealer that is the same shade as your natural skin. If you can’t find a close match, opt for one that is one shade lighter, but never one that is darker. The Lakme Absolute White Intense Concealer Stick (Rs. 500) is perfect for this because it blends easily and doesn’t make your skin look cakey. It also comes in shades that work well with Indian skin. Apply it lightly on each acne blemish in a criss-cross motion, in the shape of an X and blend it in gently by patting it instead of rubbing. Make sure you use the concealer sparingly (you don’t want your face to look caked and streaky!). 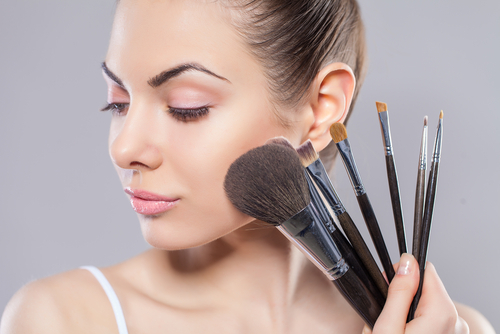 Follow it up by applying foundation with a damp sponge or stippling brush for a super natural effect. Your hectic schedule and erratic sleep cycle can take its toll on your face, making your eyes look baggy and tired. To conceal your dark circles and perk up your face, simply keep a few tips in mind. The area under your eyes has fine lines where the concealer can seep in and crack. Choose a light and creamy concealer to prevent this from happening. The Mac Studio Finish Concealer (Rs. 1,700) is lightweight, creamy and perfect for hiding dark circles. Do not apply the concealer on the entire area under your eye, but only in that semi-circle of darkened skin for best results. Dab at it with your ring finger to blend seamlessly. 3. For Some Nose Contouring! Contouring your nose will take some practice, but the results are SO worth it. If you want to slim down your nose and make it appear sharper and more slender, you’ll need two concealers: one that is two shades lighter than your skin and the other that is a shade or two darker. Invest in a contouring concealer palette (Rs 805) so you can see which colour works best on your face. Apply the darker concealer down the outer sides of your nose in two single lines. Make sure that it doesn’t have any shimmer in it. Blend it outwards onto your cheeks. Then, apply the lighter concealer in the middle, down the bridge of your nose to highlight it - and you’re good to go! It can be very annoying to go out with angry rashes on your face, so concealing them becomes very important. Hiding redness on the face is tricky, but not impossible. A lot of people prefer stick concealers to hide redness because of the intense coverage it provides, but these concealers can clog up your pores and make the breakout worse. Apply a thin layer of a green colour correcting concealer to neutralize the redness, like this one. Blend it outwards and then pick another concealer that matches your skin tone. Apply it on top of the first concealer and pat some powder on top. Experiment and see which concealer suits you best, although a mineral-based one works well since it has no oil. We all know how a double chin seems to attract attention right to it! (Especially in pictures!) WIth the right kind of makeup, however, you can make it appear slimmer or at least draw attention away from it. To contour for a well-defined chin, use a highlighting cream concealer just above your jawline. The Maybelline Dream Lumi Concealer (Rs 600) is fabulous for this purpose, and also comes in a handy stick for easier application. After blending the highlighter, use a bronzer or a darker concealer in powder form along your jawline. Place a flat brush directly on your jawline and sweep a couple of times to blend it in. This will give it a more defined, chiselled effect. You can also play up your eyes instead of your lips to draw attention away from your chin. Who doesn’t want a nice, even complexion? Skin discolouration can be caused by a variety of factors including sun damage, medicines and hormonal imbalances. WIth the right kind of concealer, however, you can even out this pigmentation and discolouration. If your problem is severe, use a colour correcting concealer with an orange tint. For less severe cases, use foundation and concealer that is the same colour as your skin. Who says concealers can only help your face glow? With this handy trick, you can use them to give yourself an enviable cleavage as well! Arm yourself with a concealer that is at least two (preferable three) shades darker than your skin and a highlighting concealer and try this trick the next time you wear a low cut top. Use a brush to apply the dark concealer on the inner corners of your breasts and blend it in nicely. Repeat the process under your collarbones and highlight the top of your breasts. Finish by lightly smattering bronzer on your chest and look fabulous through the evening. Images: Shutterstock HAVE A STORY IDEA FOR POPxo? If you want to hear about it, we can write about it! Just tell us your idea here! MUST-READ: 10 Quick & Easy Beauty Hacks For The Really Busy Girl! MUST-READ: How To Hide Dark Circles – Using Red Lipstick As Concealer! !